My good intentions of keeping my blog current has fallen to the wayside. I've been waiting to get my camera fixed, as a blog without photos just isn't as exciting. Hopefully it won't be too much longer. I've been keeping myself very busy, because...wait for it...I'm going to be an Omi!! My little grand-daughter is due to make her debut mid-August. All my current projects are on hold, and I have to work really hard on focusing, as my creative mind is going a mile a minute. I've begun knitting a little jacket, in fine white baby wool, from an old, old pattern (here is where my camera would have come in handy). I've also knitted a pair of pink Mary Jane shoes (which I did when I first found out about the pregnancy). I had a feeling all along that it would be a little girl). I've crocheted not one, but 2 little blankets--one is light and lacy for the summer, and the other is a heavier, more solid shell-stitch for the fall. I want to sew some little dresses and a couple of baby sleeper/bags, and I have a simple scrap quilt on the go. 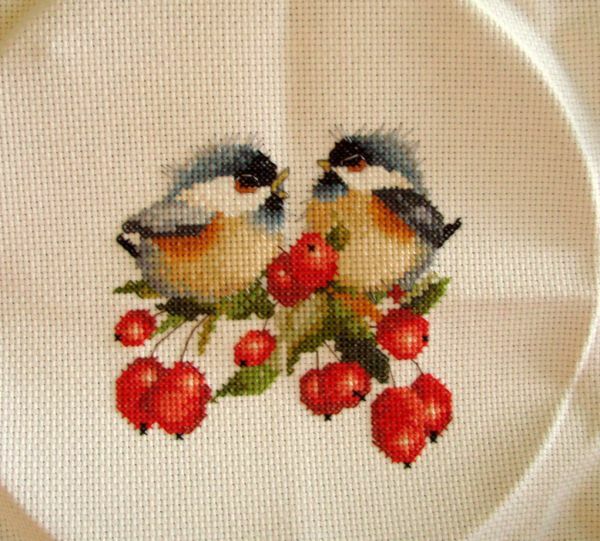 As for cross-stitch, I still haven't decided which wall hanging I will do. But I can't wait to begin stitching! It's looking to be an exciting Spring and Summer! It's absolutely frigid outside, today. -47C with windchill (that's -52.6 F). It wouldn't be ridiculous if I were a polar bear, but while I have adapted some bearish characteristics (tell me it's not only me who fattens up a bit through winter), and I do tend to hibernate in the cold months, last time I looked--no fur. What does any of this have to do with stitching? Well, what better time to cozy up with a new pattern, and start stitching a spring piece. That's what I'll do today. Maybe find a Paula Vaughan pattern--quilts and flowers. I love where my mind wanders, while I stitch. I will dream of warmer days. and then I look around at what I haven't done, the tree that is not there yet, piles of newly-made ornaments not-quite-finished. My list of things-I-want-to-make...and bake...multiplying by the hour. I've already had my annual pre-Christmas meltdown. And I realize, I need to stop. I've crossed the line from inspiration to envy to "why can't I ever get it together like everyone else?". I've done enough. I've made several new cross-stitch ornaments for our tree. I don't need to keep making more. I don't need to impress anyone...my family's joy is enough. I have to imprint the word "enough" into my mind, and allow myself to enjoy the holiday season, not stress about everything being "perfect". I think I'll put up the tree this weekend, sip some eggnog... watch some Christmas movies...and get back to feeling the spirit of the holidays in my heart. I've always been a focused person. Not necessarily in my thinking of "everyday" stuff (I'm quite scattered regarding those)...but with crafts, I never used to have a major problem. 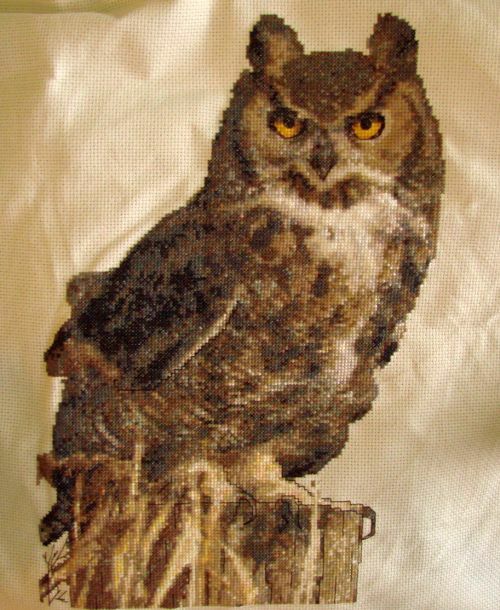 I've been cross-stitching for over 25 years, and for the most part, getting most pieces stitched. Not framed, necessarily, but the bulk of the work done. Same with crocheting. I've done many afghans over the years, doilies to make my granny proud, and various other crafts. But when it comes to the internet--I become totally ADD. I go online, with the intent to read a few stitching blogs. Click a couple of sites off *their* blogs, and now I'm in quilt land. Wonderful! I'm amazed at the beautiful quilts, and I'm all geared up to begin one myself. Click a few more links...voila, I'm in miniature land. I am so inspired by what I see, and I want to try my hand at making itty-bitty furniture...and dolls. Never mind that my eyesight isn't what it used to be! Click, click...and now I'm back to cross stitch blogs. It takes all my effort to pry my fingers off the keyboard, pick up my stitching, and focus. At this rate, I will never have my Christmas stitching done! I will set my sights (and energy) on smaller projects. I have a little Bent Creek piece called "Winter" that will probably only take me a couple of days to finish. And...I'm beginning to make a dent in my UFOs! Let me tell you, *never* again. Over 60 colours, blends of browns, grays. Hardly a few stitches in the same area, then colour change. Next time I get the urge to do "nature", I'll get me head examined, instead! A couple of finishes...(stitching, that is). I finally finished stitching a couple of pieces that I had wanted to do for a while. 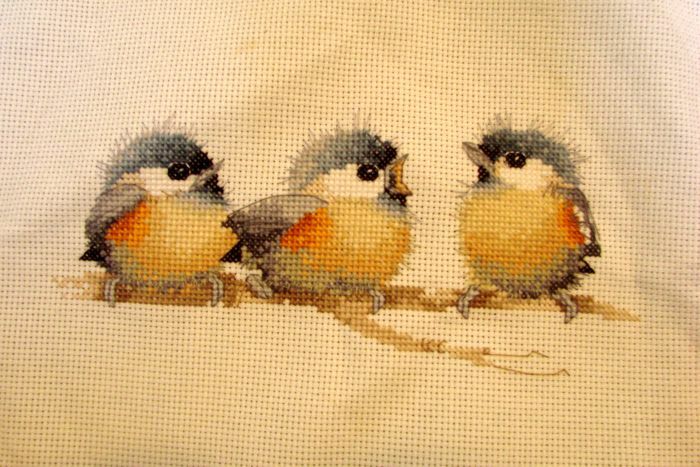 They are from Valerie Pfeiffer's line of chickadees--Sitting Pretty and Berry Chick-Chat. They are adorable! And I'd love to do the whole lot of them! Problem is, there isn't enough wall space in our apartment for them. I have very limited "empty" space. I've never had that problem before, and frankly, I don't know what I can do about it. Alternate--every month or two change the pictures? Pillows? No, hubby works with cars...and wood...and I've tried the pillow route before. Disaster! Afghan? Same as above. Grease stains do *not* come out completely, no matter what I tried! Gifts? I know a few people that would love them, but I don't want to give them away! Move to a bigger place? Done that--45 times in 50 years! No, next time they will have to drag me from here, kicking and screaming! This is why I have oodles piled up waiting to be framed. Don' t know what exactly to do with them! I know there's a solution out there...just can't think of it right now. I've been a bad blogger. Good intentions don't get things done, that's for sure. I better get off my duff. I *did* manage to dust off a couple of bins that housed my unfinished Xstitch projects. Good grief, there are at least 30 of them...just waiting to be cleaned, and framed. Why do I dislike finishing projects? I love *doing* them. I get great satisfaction in the actual work--the planning, getting all my floss colours, winding them on floss-holders. I love to get a new, crisp piece of Aida, finding the center...beginning those first few stitches. Later, it's rewarding, watching the piece evolve. But those last few days, those last few stitches--I almost get melancholic! I then lose steam, and get new vigour by beginning a new piece! (It kind of sounds like an addiction, no?). Come to think of it, though...I have a stash of homemade Christmas presents, just waiting for the final touches. No crowded malls...or sore, blistered feet, trying to find the "perfect" gift. Now I feel better about the whole thing. I just have to figure out who gets what! Good grief, does time fly. All the things I was eager to start in January, have not been started. All the good intentions I had on New Year's Eve...well, let's not even go there! I have managed to finish a couple of xstitch projects in my WIP pile...and stuck to my promise not to start a new project until an old one is done. My new project was a Valerie Pfeiffer birds--from her adorable set, of which I've already done one a couple of years ago. So now I have 2 waiting to be framed. I've begun a third one, a trio of baby owls. I've tried to take photos, but I don't like the way they turned out. I think a light box would be a good idea--I've seen plenty on-line that can be done "by scratch", not costing very much at all. Tomorrow, the groundhog emerges (is plucked) from his cozy den. It's been extremely cold here, which means the sun is usually shining--great for the spirit, but not for groundhogs. He'll see his shadow, and we'll get more winter. I always wonder...who ever thought it would be a good idea to wake up a groundhog? Happy Groundhog Day! Here's to dreaming of Spring! I'm an empty-nester, discovering my creative flow.